The 2018 Winter Olympics in Pyeongchang was one of the most exciting events this year. It not only captured the eyes of millions of people, but also filled the world with many memorable moments. Although there were some widely-renowned highlights, such as the high tech that was used during the ceremonies or the controversy with the Russian athletes, the North Korean cheerleaders stood out the most. 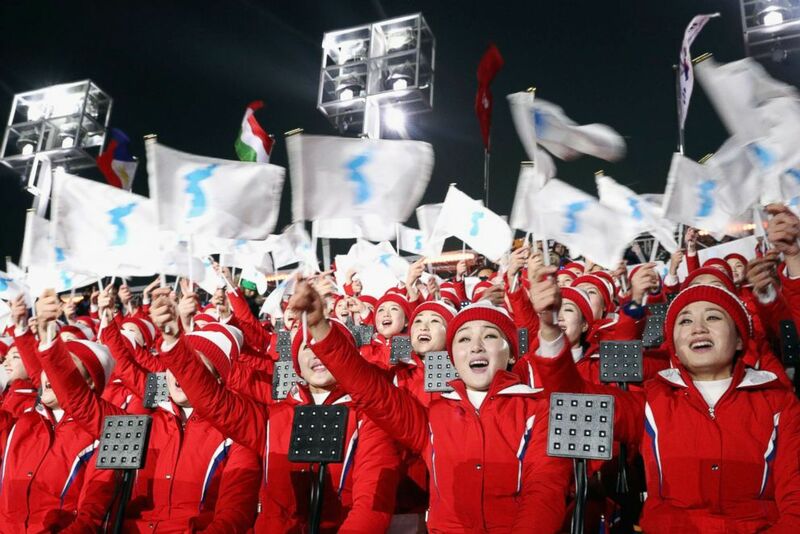 The North Korean cheerleaders attended the 2018 Winter Olympics to cheer and wave the unified Korean flag when their country competed at figure skating and ice hockey. What many don’t know is the background to the North Korean cheerleaders and what horrifying life awaits them back in North Korea. At the winter Olympics, spectators saw these cheerleaders gleefully rooting for their country. This is just a facade that they put on in the public eye, many don’t know that these women are slaves to Kim Jong Un. In North Korea, women who were in their twenties had to be attractive, over 163 centimeters tall, had to come from good families, and had to show loyalty in order to be apart of this cheerleading squad. These girls went through hours of training to learn the choreography and songs so that it could be perfect and in sync during the Olympics. At the Olympics, they were constantly observed by their North Korean bodyguards because they were stripped of their freedom while they were there. They were not allowed to be alone and had to be in groups of two wherever they went. Interaction with anyone else was extremely prohibited, they weren’t even allowed to interact with the other cheerleaders. After the Olympics, once they’re back home, these women will be forced into sexual slavery. High-ranking members of Kim Jong Un’s regime will enjoy their company. These cheerleaders also have to attend parties with the social elite, against their own will. Their human rights are infringed and they no longer have control over their bodies or their future. The Winter Olympics might have been seen, by the North Korean cheerleaders, as an event to have some sort of freedom, but it wasn’t. Before they left North Korea, they were reminded that the trip wasn’t for their entertainment and that it was strictly only for business. Therefore, they couldn’t cheer for another team or even clap because they risked being punished. Their chance of “freedom” was only an illusion to themselves and to those that watched them. These young women will never have a glimpse of freedom, although they were waving the unified flag of Korea. Until the day that both countries unite, they will suffer their fate, while we look on.